Yes, she is a billionaire. Yes, she has an amazing life. However, have you thought about what it must really be like to be one of the most famous women in the world? Dr. Melanie Watkins, Your Mental Health First! A few weeks ago, I had an opportunity to board the “O, The Oprah Magazine” and Holland America’s Eurodam to set sail to Alaska. It was the first of several cruises that will take place this year and in 2018. I did know Oprah was going to be on the ship. I didn’t know that I would be THIS close to her. I am a psychiatrist by profession. I enjoy observing human behavior and looking at what factors, e.g. genetics, lifestyle, early childhood experiences, social environments, etc. influence the way people think, feel and act. I consider myself to be a balanced, reasonable person who can remain calm and clear in challenging situations. Yet, up close to her, I regressed into something similar to a pre-teen girl attending a famous boy band concert for the first time and the lead singer is standing.right.next.to.me. Giddy, elated, and euphoric, it was hard to contain my excitement and joy. 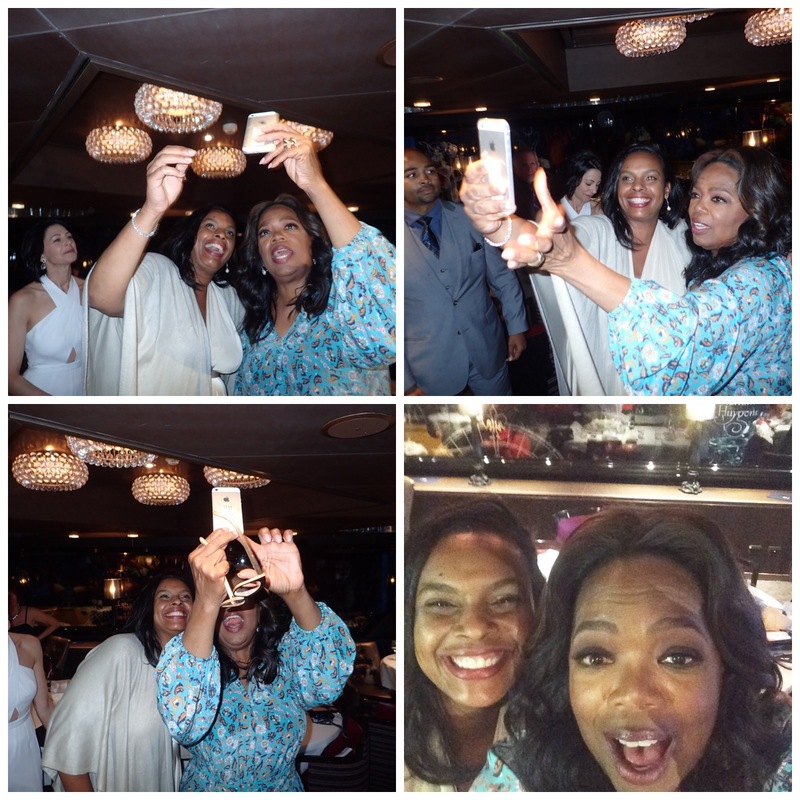 In fact, for this selfie, Oprah assisted by holding my phone for me (perhaps I was shaking too much to keep it steady!) and this beautiful, poised, confident and wise 63-year-old media mogul was teaching me how to take a great selfie. Oh, she taught me much more than that by observing her behavior and the behaviors of those around her. 1) It is not easy being Oprah—She has security and probably several good reasons for doing so. She can’t just go up to the lido deck because she has craving for a low Weight Watcher smart points treat at 2am. She can’t just walk around the ship’s deck and take in the breeze and view without having people around her. Everything she does or doesn’t do could be judged. She can still, even at this point, be seen as being too generous or not generous enough. Even doing something kind can cause unwanted consequences, for example, if Oprah were to accept a gift from one passenger but doesn’t take a gift from another passenger. Or, if she were to give out free T-shirts and she didn’t happen to have size XXS available, someone might consider that, well, inconsiderate. Proximity. I’m not a total germophobe (I am a physician, yes), but if a large number of people were hugging me and touching me over and over again (which, statistically speaking, a certain percentage will definitely have an upper respiratory infection of some sort or do not consistently wash their hands every time they go to the restroom), I’d become a bit uncomfortable. Not to mention different smells, shapes, and sizes of we lovely human beings, add some occasional nervous perspiration and anxiety-induced dry mouth leading to halitosis. You get what I’m saying. Gifts. Celebrities and their staff can be ambushed with *stuff* and *requests*. People want things, for themselves, their loved ones and others. Can you make the gadget I invented one of your favorite things? Can you support the charity I started for at-risk youth? Can you read my self-published book about reincarnation and make it one of your book club selections? Well, what about a well-meaning and thoughtful gift, truly from the heart. Hey, even 100 bottles of wine, 100 bouquets of flowers and 100 assorted items of various sizes, like stuffed animals, jewelry, books, etc. would require some effort on the celebrity and her staff to take back home. It just isn’t practical for some celebrities. Some people are hurt when their gifts aren’t accepted, without realizing what is involved with receiving it. Conversations. After hearing a million thank-yous, accolades, and praises–do the phrases and expressions lose some of their value over time if you hear it every time you are at an event? I know you don’t want to be one of those people, but it is challenging to not end up becoming one of those people because you are one of thousands! There is only so much you can say in a short period of time. How does a celebrity discern the level of impact her life has had on one person versus another in less than 60 seconds? The intensity of emotion? The volume of one’s speech? The reluctance to wrap up the conversation and allow another person to have their experience the celebrity? Yet Oprah is a master at this and she was gracious, attentive and present. Which then made me think, why does she even show up given all that I mentioned above? She doesn’t have to. She chooses to. 2) She chooses to be Oprah–The whole experience gave me even more appreciation for what and who Oprah is and what she does. She is at a place in her life where she doesn’t have to do these things. She doesn’t have to take selfies with psychiatrists or strangers or strange psychiatrists. She doesn’t have to be as visible as she allowed herself to be. She doesn’t have to be as generous as she continues to be. And her bestie? Gayle did not stay in her cabin. She was seen on the decks, in the gym, in front of the stage meeting fans. Gayle didn’t have to dance on the dance floor with us (okay, I didn’t take a photo of her doing the wobble. I don’t want anyone to see me a video or photo of me wobbling and I thought I’d extend her the same favor. You just have to take my word for it!) Oprah and Gayle took photos with many cruise guests, but these women made the choice to do so. And to know, at this level, where these women are in their lives, it means so much MORE. A publicist is not telling them to do this, or do that, to “promote their brand” They are already established. When I had the chance to talk with Oprah, I wanted her to know that I know these two things for sure: It is not easy being Oprah and she chooses to be Oprah. Even in 1994, as an 18 year old pre-medical student, I read that she was running the Marine Corps Marathon. She had joked about not being able to step aside and take a discrete “pee” break due to all the reporters around her, which was my first lesson of what life what must be like for Oprah and the sacrifices that being in the public eye present. Dr. Melanie Watkins is a board certified psychiatrist based in Walnut Creek. She specializes in a variety of clinical services including psychiatric evaluations and consultations, medication management, and psychotherapy.